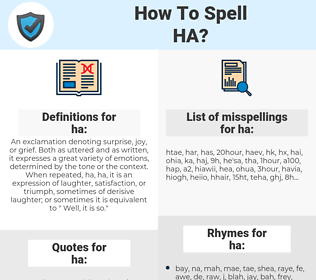 What are the misspellings for ha? What are the common mistypes for ha? What does the abbreviation ha mean? What are the quotes for ha? What are the rhymes for ha? 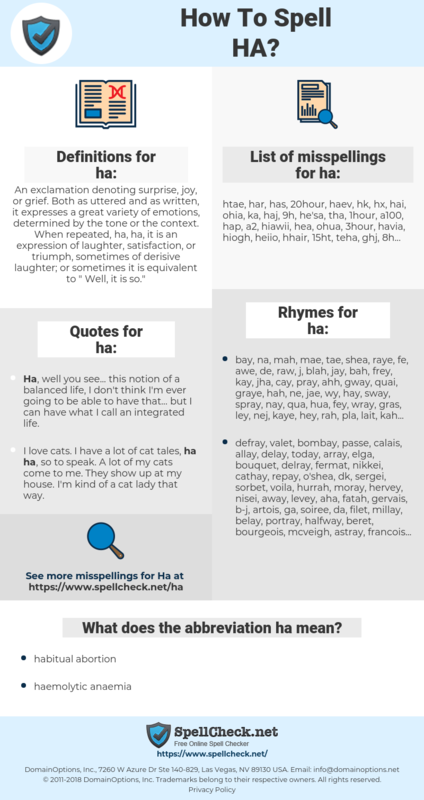 What are the common typos for ha? An exclamation denoting surprise, joy, or grief. Both as uttered and as written, it expresses a great variety of emotions, determined by the tone or the context. When repeated, ha, ha, it is an expression of laughter, satisfaction, or triumph, sometimes of derisive laughter; or sometimes it is equivalent to "Well, it is so." Ha as a girl's name. This graph shows how "ha" have occurred between 1800 and 2008 in a corpus of English books. Ha, well you see... this notion of a balanced life, I don't think I'm ever going to be able to have that... but I can have what I call an integrated life. It's not the first time that I speak with American journalists. I've had meetings with many different newspapers and stations, and I've ha- never had a problem with meeting with American journalists. Things aren't much wilder now, I don't think, than they were back then. Of course I just read about all the goings -on now. Ha.